You've probably been hearing how easy it is to protect your family, your home and your valuables these days. It's nothing like the hassle that it used to be. Technology has changed everything, and simplified it, too. That's because wireless technology has made installing home security an afternoon project, rather than the all-day nightmare that it was when techs had to drill holes in your walls, cut wires and mount a system that worked just OK.
Our sponsor SimpliSafe has disrupted everything about home security. As SimpliSafe likes to say, "There are no annual contracts, no middlemen and no landline needed. You get superior protection for less than half what traditional companies charge." But the best part may be that it's so easy to install. Eight components will arrive in the mail, including a keychain remote control for your SimpliSafe home security system. Most of the other components take just a few minutes to install. That's because you simply remove the adhesive tape, stick the component to the wall and activate the lithium batteries, which have about a 5-year battery life, by removing the battery-activation strip. You may have seen the futuristic-looking SimpliSafe base station. It seems to float over a blue light. It's the central component for your home security system with an 85db alarm and mini cellphone that will contact SimpliSafe. It's also the only component that plugs in, although it does have a backup battery. When you start installing your system, you'll hear the base station talking back to you. "Welcome to SimpliSafe" and so on. Once you plug in your base station, you're ready to install the SimpliSafe system. Do you have five minutes? The SimpliSafe wireless keypad is where you'll type in your personal identification number (PIN). If your home is broken into, burglars will not be able to deactivate the keypad. If they smash it, SimpliSafe will be alerted. To install, remove the adhesive backing and battery-activation strip, then press it firmly to the wall. That's it. SimpliSafe's entry sensors can be set up on doors or windows. Each one has two parts, a magnet and a sensor. You'll install the magnet on one side of the door or window and the sensor on the other side, right next to each other. So when someone opens the door or window, the sensor is triggered. To install, remove the adhesive backing and battery-activation strip. Press firmly against your doors and windows. These one-piece sensors are shaped to fit into corners. Install it by removing the strips and pressing firmly against the wall. The thermal motion sensors will sweep the room for intruders. Don't worry - it won't be triggered by most pets. Talk about peace of mind. You can set up the SimpliSafe panic button by your bed or close to a family member who may need extra protection. Just push the panic button and SimpliSafe is alerted that something is wrong. That's home security! To install: Remove the adhesive backing and battery-activation strip. Press the panic button firmly against the wall. You can set up a second alarm. This one triggers a piercing 105db alarm, which is as loud as a rock concert! SimpliSafe doesn't skimp on home security. These are multi-layered home security systems that protect you from intruders, the weather outside and prowlers. It starts with an incredibly loud alarm that will scare off most burglars. One is a super-loud 85db siren and the second one is a 105db siren. There are sensors for your doors and windows. Plus, SimpliSafe has devices to alert you to fire, carbon monoxide, freezing pipes, flooding and more. SimpliSafe has sensors to alert you to broken windows or even if the keypad is smashed. Not only that, but SimpliSafe is almost instantly alerted when your system is activated. This is state-of-the-art technology, so you can imagine how quickly you'll know that your family and home are at risk. You can receive a text message alert or watch a live-stream video from inside your home and outside your home with SimpliCam video cameras. 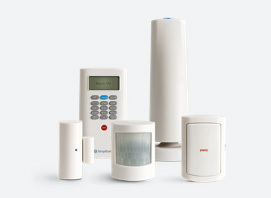 SimpliSafe will give you peace of mind knowing that you're protecting your family and home. And now you can get a 60 day guarantee! Click here for an exclusive SimpliSafe deal courtesy of Komando.com! Burglars love the winter! Why? It's simple. Your home is vulnerable when it's cold and icy outside. There's a good chance your family heads off to warmer climates this time of year for a few days or a few months. Plus, your neighbors aren't watching your house like they do the rest of the year. They're inside like you, all bundled up. Click here to find out how to keep your home safe this winter!